Satanic old-school death metal band SHED THE SKIN will be releasing their second full-length album "We of Scorn" on July 27th, 2018 via Hells Headbanger Records. Knowing the past of the members kind of lead you into listening with high expectations. SHED THE SKIN was created by drummer Kyle Severn (INCANTATION, VITAL REMAINS, ACHERON) and guitarist Matt Sorg (RINGWORM, BLOOD OF CHRIST). Add in Ed Stephens (SINISTER), Ash Thomas (ARCHERON) and Brian Boston (FROM THE DEPTHS) you have got some serious powerhouse players. “We of Scorn” begins by surveying the damage. An ambient and reflective intro is followed by a doom like march that eventually builds into a revengeful motivation of slowly rolled double bass kicks and a melodically triumphant rhythmic lead. Once the smoke clears the howl signifies the transition into a faster pace, setting the true direction of “From Tortured Realms.” The tremolo picking drops into the first solo that is short, sweet and blended like the perfect PB&J. “Legion of the Scorpion” scorches like the desert sun in its fast pace of metal ritual carnage. Steady palm mute rolls are broken apart by stabs and two-chord slides. The main riff leads into the transition and shows the band dynamic as they stomp in on accents and then proceed full speed ahead into another verse. The lead is old school speed metal picking joined with a strategic melodic methodology. For some reason, I saw the last track named “Forever” and instantly thought, “WTF, is this going to be some death metal ballad?” How very misleading as it is likely the most devastatingly kick in the crotch that “We of Scorn” has to offer. A slight change in the vocal tone as it steers a little more into the black metal direction as does the picking structure. Still combined with a death metal beat that is executing tactical utilization of the entire instrument rather than ruthless blasting. SHED THE SKIN live up to everything you could expect and want considering the musicians that make up this beast of a band. The depth of the vocals is tonally controlled to perfection and carry out a grotesque gargling sustain. The guitar lines are well equipped with skill and very fitting as they overlay multi-part harmonies. The drums, c’mon, its Kyle. The guy is so consistent with his attack and just flawless. 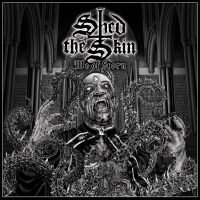 SHED THE SKIN is great for fans that could imagine a mixture of MONSTROCITY, ENSLAVED, MARDUK & IMMOLATION. The audio production quality is stellar on PC and in the car. “We of Scorn” is the kind of album that you just got so lost in while driving you go the extra couple of miles out of the way just to keep listening.